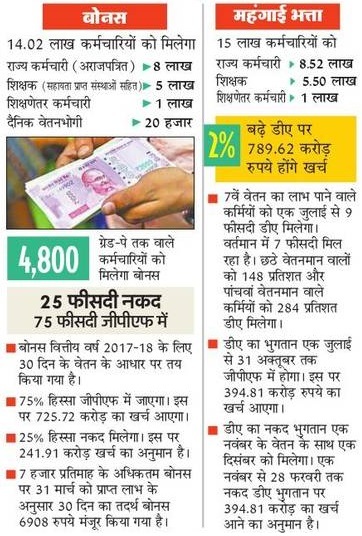 UP Teacher Salary 2019 Regular TGT PGT, Principal, Anudeshak Instructor shikshamitra, lt grade Junior High School are paid according to the 6th and 7th Pay Commission scale as UP teacher salary 2016. It includes Madhyamik School GIC GGIC, Pravakta professor government Inter College all categories of teachers who are under aided colleges in contributed by central government the purview of this study - Elementary schools of the Basic Shiksha Parishad, Government Secondary Schools and Secondary Aided Schools. 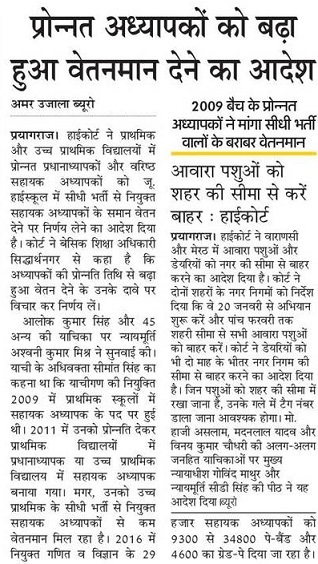 UP Maths Science Teacher Primary Salary : Latest news 13 January Allahabad high court has given order for promoted Assistant Teachder issue on salary on the basis of directly recruited teacher. In 2016 Maths Science Teacher total posts was 26,000 and they are receving salary in the grade pay of Rs 9300 to 34,800 Pay Band and 4600 Grade Pay. 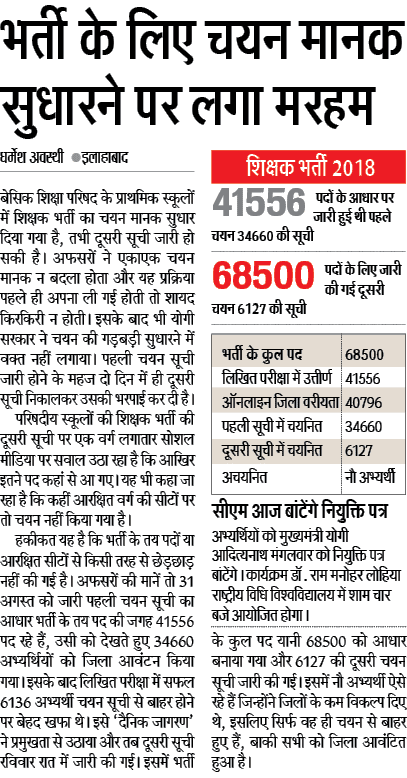 41,000 New Appointed Primary Teacher may soon get 40,000 Per Month salary in their bank account. Many Fresh teacher complaint about not getting salary, so some officer who involve in making salary slip for new assistant teacher said to all teacher to make below things. 1. 100 Rupees Stamp Paper Halafnama. 2. Verification of Teachers online offline. 3. Salary payment starting from January 2019.
e pension up: latest news 19 November is UP Govt employee and primary teacher wants all pension scheme. So they will not work on 29, 30 November 2018. Eltimatum given by state govt employee of uttar pradesh to current up govt for pension scheme they wants before vidhan sabha election. 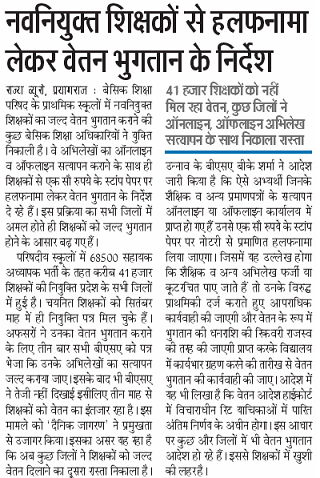 UP Vitt Vihin Shikshak Mandey 2018: Latest news 5 November 746 Degree College Teacher will get Salary and may become Permanenet employee after Diwali. 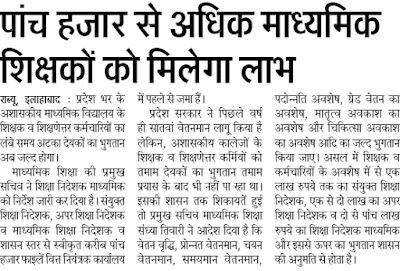 Latest News for getting Vitt Vihin Shikshak Mandey/Degree College Teacher Viniyamiti karan is candidates will get all types of information in counselling time and they will bring Adhaar card mobile number to approve their salary in bank accounts. 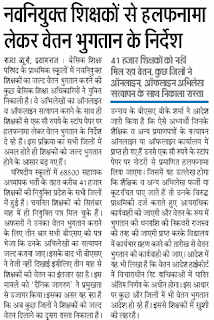 UP BTC Teacher Salary, UP LT Grade Teacher: On 3 November Government order issued to give bonus of DA, Diwali Bonus to 5.5 lakh teacher in all govt sector. below you may check bonus candidates list. Basic Shiksha Vibhag Satvan (7th) Vetan:-UP State Govt has added some money of 7th Pay Commission into Basic Shiksha Karmi and Primary Teacher. And it is called Arrear. The Arear of 7th Pay commission given to govt employee mentioned below. 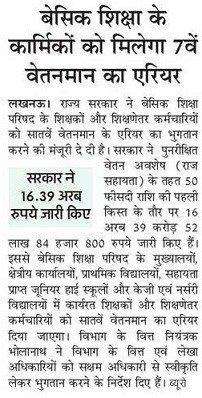 UP Primary New Selection Salary:- Newly selected primary teacher from 68500 vacancies will get minimum salary Rs 41,000 per month. Primary teacher first payment will be received after verification of documents. Salary of B.ED BTC Pass Primary Teachers:- Basic Pay Rs. 35,400, 7% DA, Housing Allowance Rs 1800. UP Teacher HRA CCA News 2018:- UP Government has increased 15 Lakh employee housing rent allowance, cca of all primary teacher in major city, village and town. In multiple times HRA, CCA payment will be added to get from July month salary. 500 Crore Budget Passed to give Basic Primary Teacher Salary and from next all Teacher take salary on 7th pay commission basis. 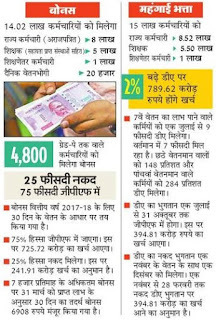 UP Teacher Salary 2018 Madhyamik school salary details emoluments of teachers are comparable with mid-level professionals. Given the fact that large proportion of teachers are posted in rural or semi-urban locations or small towns, most teachers reported that they are comfortable with their salaries. According to an analysis done by Kingdon and Muzzammil (2008)2, the ratio of annual average teacher salaries to annual per capita income in Uttar Pradesh is 8.5:1. UP Teacher increment for regular teachers (primary, tgt pgt Anudeshak lt grade Shiksha mitra) are an annual process. All teachers get an increment of 3% per annum in their basic pay as well as grade pay. The date of annual increments is fixed, which 31stJuly is. It should also be noted one increment is provided to teachers for family planning initiatives for all categories of regular teachers. 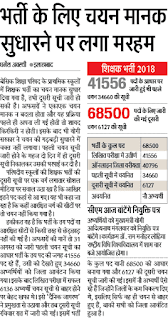 Structure of teacher salaries in Uttar Pradesh is the same as all state government employees. This includes Basic Pay, Grade Pay, Dearness Allowance, House Rent Allowance and City Compensatory Allowance. Basic Pay and Grade Pay are dependent upon the scale. Dearness Allowance and House Rent Allowance are a percentage of Basic Pay and Grade Pay together. In Uttar Pradesh, like in most states, both these allowances are usually kept equal to that of Central Government and are revised as and when the Central Government revises the Allowance. At present, the DA is 100% of basic plus grade pay and HRA is 10%. City Compensatory Allowance varies across cities and bigger cities and towns have higher allowance. Latest News 22 January 2018. 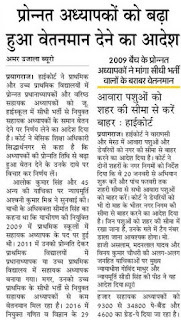 UP BTC Primary Teacher Salary of 2006 recruited candidates will get salary by high court news for BTC People.